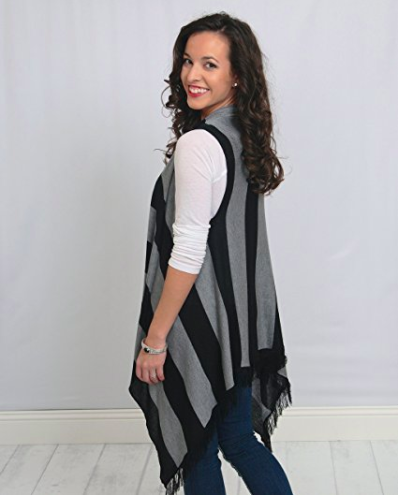 TRENDY: Sleeveless, fringed, lightweight vest cardigan wrap. Looks great with a long or short sleeve shirt underneath. 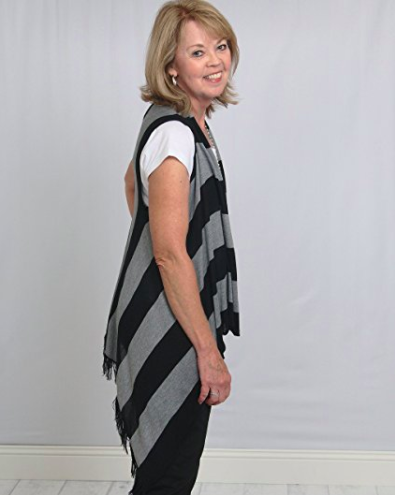 STYLISH: Asymmetrical front cut shawl, with a longer draped back for flattering fit. 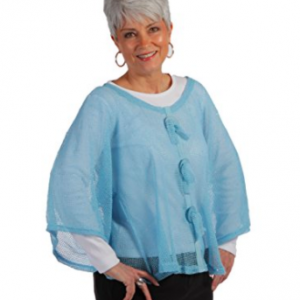 Open waterfall front hem is 6″ shorter than the back hem. EASY CARE: 100% Acrylic, Hand Wash or Dry Clean. 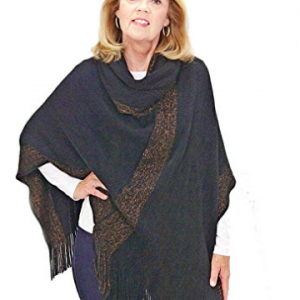 ONE SIZE: This shawl fits most. Measures: 38″ length to fringe hem. Measures: 33″ width thru hip area. 100% SATISFACTION GUARANTEED: If you’re not 100% happy with your purchase, let us know! It could easily become your Spring and Summer Essential! 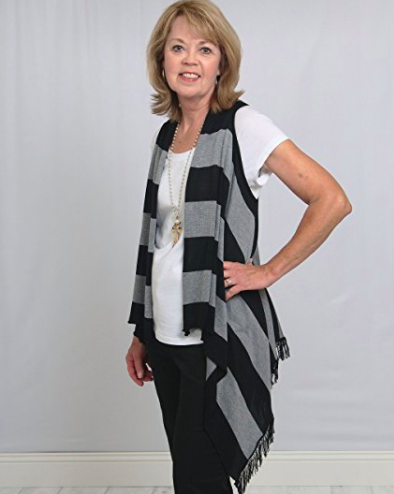 This lightweight sleeveless open cardigan sweater is a perfect layering piece for your tunics, with jeans or over your Summer dress. 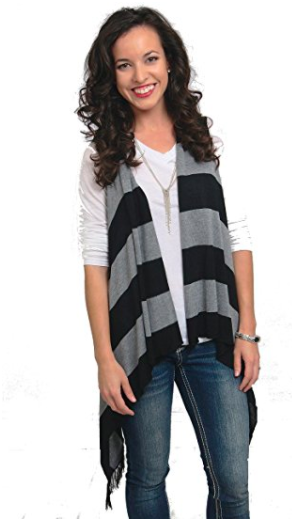 Whether it’s a chilly office or an unexpected night on the town you will want this cute vest to be an essential part of your Spring and Summer wardrobe! The bold pattern is a classic and will still be trendy in the Fall. This luxurious wrap is characterized by graceful simplicity and transforms any outfit into a timeless look worth remembering. Ultra-soft fabric provides maximum comfort and an added stylish layer to any outfit. This fashionable wrap allows for easy movement and flexibility while ensuring you stay up-to-date with the latest fashion trends.It is perfect for casual days at the office and evenings on the town when your outfit needs that little extra bit of magic to make you stand out amongst the crowd. The dramatic black and gray stripe captures the looks of the season perfectly and adds a blended taste of the season, for a regal finishing touch on your outfit.Made from 100% acrylic, the premium fabric provides a flowing and textured look to compliment any figure. The lightweight fabric makes it easy to bring around with you on-the-go and folds up nicely as you travel. This fringed vest is a perfect gift for any occasion: Birthday, Mother’s Day, bridesmaids’ gifts, etc.